Hammer Highlights is a blog series that features the past year's most memorable moments and stories from each of our departments. Jim Fetterley from our Technology department shares his favorite moments from 2015. The Hammer Museum is host to over 300 public programs and special events annually that take place all over the museum—often simultaneously—while also sometimes questioning whether an exhibition can also be a concert, as in ALL THE INSTRUMENTS AGREE. In 2015, the Hammer audience found themselves witness to the whole museum presented as a stage. While on the way to the Billy Wilder Theater, guests may have caught the long form choreography of Maria Hassabi on the way to a screening of Citizenfour as part of the The Contenders series. The live installation of the multiple performers could be found on the stairs—or throughout the courtyard—moving to an expanded ambient soundtrack that tied these non-gallery spaces to her installation in Gallery 6. If nobody watches a performance, how do we know it happened? With the performers spilling out of the gallery and into the open spaces, lines were blurred intentionally between the audience members and performers. It was great to see visitors' curiosity piqued as they happened upon something they did not expect. 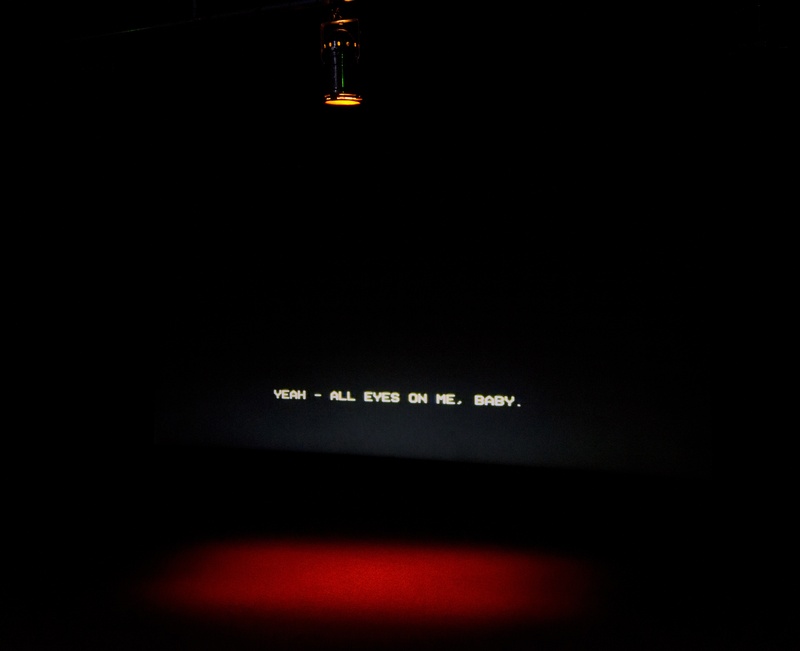 Gallery 6 was also where Yuri Ancarani’s three films were presented in a hair tingling surround sound video installation. I loved these films! Sometimes, I like to think of the order in which installations follow each other. For example, Frances Stark’s Bobby Jesus’s Alma Mater b/w Reading the Book of David and/or Paying Attention Is Free filled the Video Gallery just after Mark Bradford’s Spiderman, which seemed appropriate and uncanny. 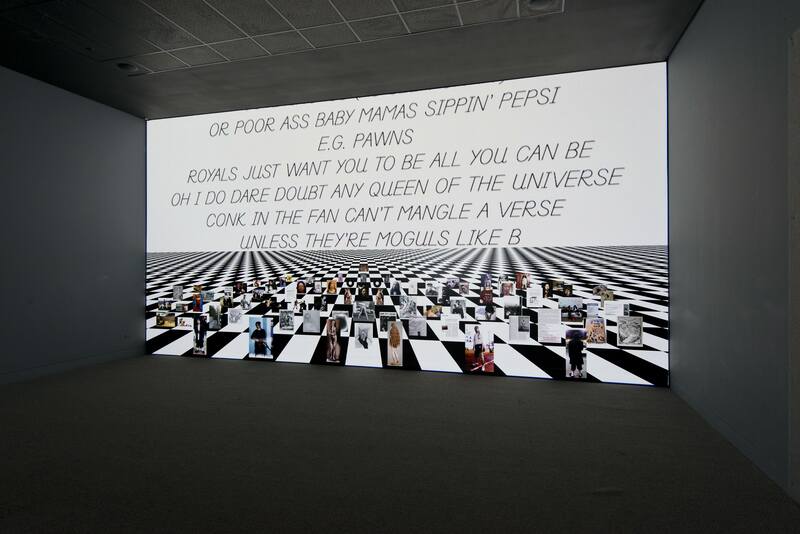 The use of text on screen with music in both couldn’t be any more different, but somehow it made perfect sense to me that these two powerful video installations occupied the same space, but one after another. On Monday, April 13, from 12:30–2 p.m., the Hammer invited visitors to step up and speak freely for one minute about freedom of speech as part of a participatory performance re-staging Tania Bruguera's Taitlin’s Whisper 6. This event was streamed live online—like almost all of our public programs—but it was one of our first experiments playing around with the new social media app Periscope. Throughout the year, the Hammer explored the limits of our physical space for live events and performance art, while also continuing to experiment in digital space. For those that do not live in Los Angeles or cannot make it to our events, our website has a Watch + Listen section where you can binge watch all of the programs that we recorded. Game Art Festival is one of the more technically complicated events to set up and present at the Hammer Museum, partially because our goal is to have the technology take a back seat to the audience participation. Making the technology as hidden as possible makes it less intimidating and provides an atmosphere more akin to a video arcade, and less of a tech trade show. Pedro Reyes's fully immersive People's United Nations had over 250 volunteer performers—far out-numbering the audience members over the course of two days. This performance occupied just about every nook and cranny of the museum. The back of house staff—comprised of Security, Technology, Facilities, and Visitor Experience teams—are performers in an invisible 24/7 symphony at the Hammer Museum. It’s this work that emphasizes that the most important technology in the museum is our staff.